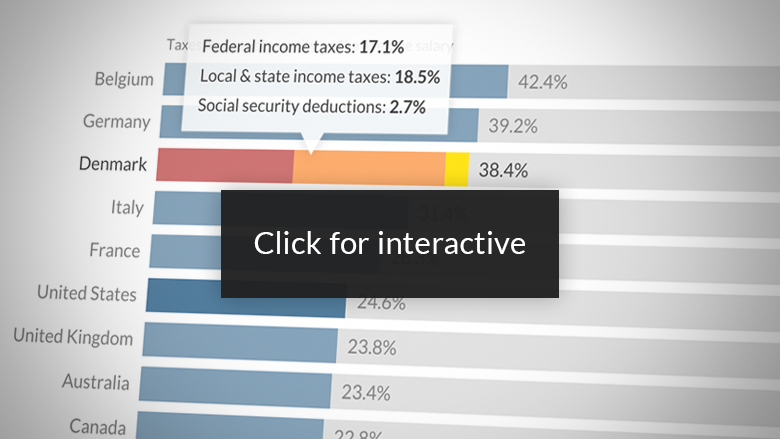 See how your income taxes stack up by clicking the image above. Income taxes are an irritation for most workers around the world. But not in India, where the average worker pays zero income tax and social security, according to data from the Organisation for Economic Co-operation and Development (OECD). India is the only country tracked by the OECD's annual survey of 39 nations where the vast majority of workers get to take home 100% of their salary. But before you start thinking that India is some kind of haven, consider this: The average Indian worker only makes about 80,000 rupees per year -- that's roughly equivalent to a U.S. salary of nearly $5,000. And they still pay many other taxes, including sales tax. In India, most workers only pay income tax when earn they over 250,000 rupees per year, or more than three times the average wage. Only a tiny fraction of Indian workers surpass this threshold. India's government collected about $220 billion in taxes in the last fiscal year, with roughly a third of the cash coming from corporations. Rich individuals contributed about $40 billion in income taxes. By comparison, the average worker in China, Mexico and Brazil pays roughly 10% of their salary in income taxes and social security, according to the OECD. Belgium imposes the highest levels of income tax in the world, with a rate of 42%, including social security. While these discrepancies between nations may seem deeply unfair, they often reflect big differences in the provision of public services and welfare.